My son use to be soo overwhelmed at bedtime/sleeptime that he couldnt get past the 'feeling' of his room, the bed, blankets, pillows. We spend alot of money on trying different bedding, we even invested in a bunch of mattress toppers, duvets, foams... it went on and on for years. Then one night while staying with my mother (who has a 'silly' amount of clocks in her house) we found that our son would be soo busy focusing on the ticking of the clocks, the swinging tail of the cat clock, the moving eyes of the owl clock, the chimes hourly of the father clock... she has over 50 clocks in her entire house and we hate sleeping there, hahaha- those clocks keep me awake most of the night. 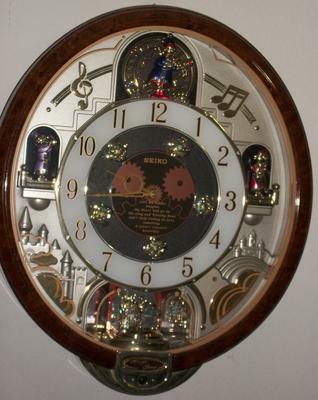 So when we returned home we took with us his favourite clock as a gift from grandma, and we also stopped and bought him a special one from mom and dad for sleeping so well the night before. Insanely, that night, he slept like a rock, he woke once to run into our room to loudly whisper if we heard the clock's music. We hadnt, but we told a white lie that we had and it was wonderful- he agreed and ran off to bed. I checked on him in the middle of the night and he was fast asleep. Now our nights are much more peaceful... besides the clocks. I dislike clocks. Hahaha.